Etter was fascinated with novelty and sought out exotic varieties to serve as parents in his breeding experiments. Early on, he came to focus much attention on an obscure apple with unusual pink flesh aptly titled "Surprise". This apple was brought into the Ohio River Valley by immigrants from Germany around 1840. It probably originated in Turkey and pomologists speculate that its ancestry traces back to Malus pumila "Niedzwetzkyana", the Redvein Crab of the Transcaucasus region. Despite its colorful flesh, Surprise was not especially esteemed in this country; its skin tended toward an unattractive dullish green and the flesh was acidic and lacking in sweetness. 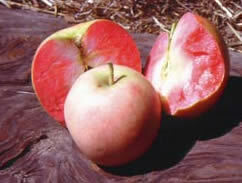 It did, however, perform better in Ettersburg than in most other places, and Etter was inspired to use Surprise as the genetic foundation for a new breed of high quality pink-fleshed dessert apples. By 1944, he claimed to have selected 30 promising new varieties of this class. Pink Pearl, one of the last of Etter's Surprise hybrids, was the one singled out by George Roeding, Jr. for patenting and official introduction. The others were largely ignored - except for a few trees grown by Etter's friends and neighbors - and left to languish in the breeder's decaying experiment orchard. When we arrived on the scene in the 1970's, searching for these pink-fleshed (and pink-blossomed) varieties became a family pastime, both in Spring and in Fall. Eventually, we recovered a dozen different examples of these Surprise hybrids - which we propagated and tested in our own orchard. The seven that we deemed outstanding were given names with trademarks registered to Greenmantle Nursery. These were then introduced to our customers on a trial basis; non-propagation agreements are a requirement with purchase. We call this group of our seven pink-fleshed selections the Rosetta™ Apples. qualities that make it worthy of trial. Success will depend on climate, site, and the season..... 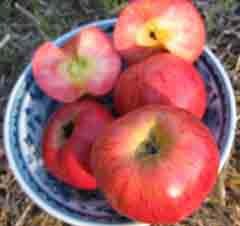 But when well-grown several of these varieties will rank among the most beautiful and flavorful of all apples. For a more detailed and comprehensive discussion of pink and red-fleshed apple varieites, see the article Albert Etter and the Pink-Fleshed Daughters of "Surprise" by Ram Fishman, published in Fruit Gardener (The Journal of the California Rare Fruit Growers) Vol. 27, No. 3, May/June 1995 . 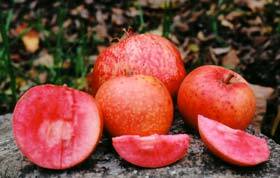 This article discusses Etter's work and compares it with that of Niels Hansen (1866-1950) who bred cold-hardy red-fleshed culinary apples and ornamental crabs using Malus pumila "Niedzwetzkyana". PINK PEARMAIN® ( CV. Etter 14-9) Ripening a week or two after Pink Pearl (early September), this can be an exceptionally colorful and attractive fruit: deeply red/red-striped skin covering vivid mottled pink flesh. Like Pink Pearl, it must be fully ripe for maximum sweetness and color. The aromatics are complex and suggestive of berries. Its main drawback comes from its ripening season; the intense heat common here in August and September can adversely affect texture and flesh color. (Pink Pearl also suffers to some extent.) 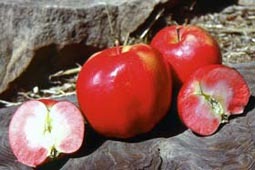 Nevertheless, in a good year - or in a cooler climate - Pink Pearmain® is a unique and worthy variety. It is also the latest blooming of the group, an advantage for frosty locations. BLUSH ROSETTE ™ ( CV. Etter 14-1) Like Pink Pearmain® , this ripens in September and can suffer from heat damage during periods of extreme high temperatures. 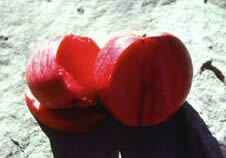 As the name implies, it is a blushed red apple with the bright pink flesh glowing through the cream ground. 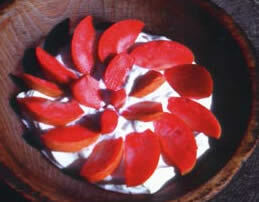 Blush Rosette™ at its best is a beautiful fruit, medium to large in size with extraordinary dessert quality. The flavor is robust and complex: high in sugar, acids and memorable aromatics. 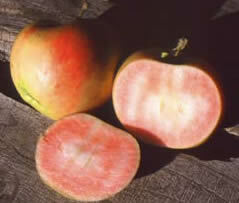 We regard Blush Rosette™ as one of the best apples - regardless of flesh color - of its season. THORNBERRY ® ( CV. Etter 16-32) Because it ripens in October, Thornberry® generally escapes the tendency toward mealiness that can plague earlier varieties. It resembles Pink Pearl in appearance - except for smaller size and less translucent skin. The flesh is the color of raspberry ice cream and the flavor confirms this association. Thornberry® in bloom makes a strikingly ornamental tree on account of its purplish-pink blossoms. 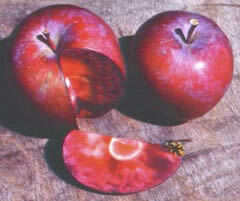 It shares Pink Pearl's susceptibility to scab, so attentive pruning and training are needed. RUBAIYAT® (CV. Etter 8-11 ) This is the gem of the Rosetta™ collection: Radiant red inside and out. Its dessert quality is superb with a unique variant on the berry-like aromatics typical of its class. We were very fortunate to discover and save this variety before the sole specimen tree was bulldozed by cows. Trees of Rubaiyat® tend toward a compact, natural semi-dwarf growth habit. The medium-sized fruits ripen in late October. CHRISTMAS PINK ® ( CV. Etter 12-9) Although Albert and Katharine did not have children of their own, they did have many nephews and nieces; Albert was one of ten brothers, several of whom ranched on nearby parcels. It became a holiday tradition in the Etter family to decorate the Christmas tree with pink-fleshed apples that had been stored since Fall. These "Christmas apples" were then given to the children for dessert. 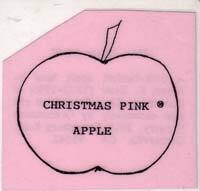 The apple we named Christmas Pink® does indeed make a charming ornament; the deep pink flesh color suffuses the creamy translucent skin. 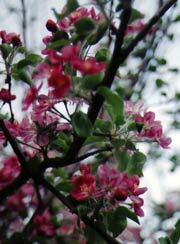 It is a briskly tart apple when we pick it at the start of the rainy season. After a few weeks in storage in the barn or refrigerator, it mellows into a richly flavored apple that can be enjoyed in salads, desserts, pies, or cider. The melting flesh is exceedingly juicy, so combined with its color it calls to mind a very sprightly watermelon. GRENADINE ® ( CV. Etter 7-13) One of the last apples of the season, this variety would ripen on the tree here in mid-November. However, it is probably best picked in October and finished in storage to avoid possible rain damage. Grenadine® has the most deeply pigmented flesh of the Rosetta™ selections - and this color shows through the skin, creating a dull purplish effect somewhat reminiscent of a pomegranate. Like Christmas Pink®, it tends to be rather sharp until mellowed for a few weeks in storage. When ready, it makes a colorful and festive fruit for all holiday uses. PINK PARFAIT ® (CV. Etter 7-9) Albert Etter was born and died on Thanksgiving Day, and we have always associated this holiday with him. 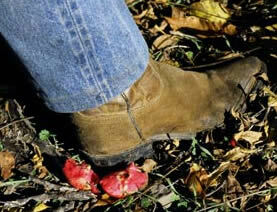 So the end of November became a favorite time for us to explore his old orchard for late ripening apples. It was on one of these Thanksgiving expeditions that we discovered the apple we call Pink Parfait® - the latest and finest flavored of the pink-fleshed varieties. 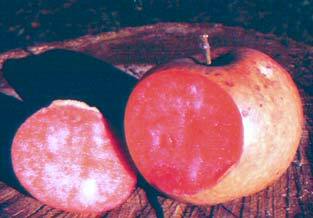 A large handsome fruit with bright red stripes and splashes over a cream background: the flesh is mottled pink and cream, almost as if an ordinary apple were stained with cherry juice. And the flavor and texture are amazing, making Pink Parfait® an unforgetable eating experience. It requires a long warm growing season and can be tricky to finish properly. Those who can grow this apple well are truly fortunate. Rosetta ™, Pink Pearmain®, Blush Rosette™, Thornberry®, Rubaiyat®, Christmas Pink®, Grenadine®, and Pink Parfait® are trademarks of Greenmantle Nursery. These varieties are propagated and sold exclusively by Greenmantle Nursery. NO UNAUTHORIZED PROPAGATION OR SALE OF TREES.